This is a comprehensive article on the classification of bricks – types of bricks – based on various different criteria. This article is from Civil Today – please follow the link to read the complete article. “Bricks are a regular size rectangular unit. Bricks are made of clay. They are usually used for most of the building works. Bricks are most generally used as a substitute for stone when the stone is not available. *for making coarse aggregates of concrete. Second Class Brick: The size is standard, color is uniform yellow or red. It is well burnt, slightly over burnt is acceptable. It has regular shape; efflorescence is not appreciable. The absorption capacity is more than 10% but less than 15%. Crushing strength is 175kg/cm2(mean) where the minimum is 154 kg/cm2. It emits a metallic sound when struck by another similar brick or struck by a hammer. It is hard enough to resist any fingernail expression on the brick surface if one tries to do with a thumbnail. It is used for the construction of one-storied buildings, temporary shed when intended durability is not more than 15 years. Third Class Brick: The shape and size are not regular. The color is soft and light red colored. It is under burnt, slightly over burnt is acceptable. It has extensive efflorescence. The texture is non-uniform. The absorption capacity is more than 15% but less than 20%. The crushing strength is 140kg/cm2(mean) where the minimum crushing strength is 105kg/cm2. It emits a dull or blunt sound when struck by another similar brick or struck by a hammer. It leaves fingernail expression when one tries to do with the thumbnail. Unburnt Bricks: These are half burnt bricks. The color is yellow. The strength is low. They are used as surki in lime terracing. They are used as soiling under RCC footing or basement. Such bricks should not be exposed to rainwater. Burnt Bricks: Burnt bricks are made by burning them in the kiln. First class, Second Class, Third Class bricks are burnt bricks. Over Burnt or Jhama Brick: It is often known as the vitrified brick as it is fired at high temperature and for a longer period of time than conventional bricks. As a result, the shape is distorted. The absorption capacity is high. The strength is higher or equivalent to first class bricks. It is used as lime concrete for the foundation. It is also used as coarse aggregate in the concrete of slab and beam which will not come in contact with water. 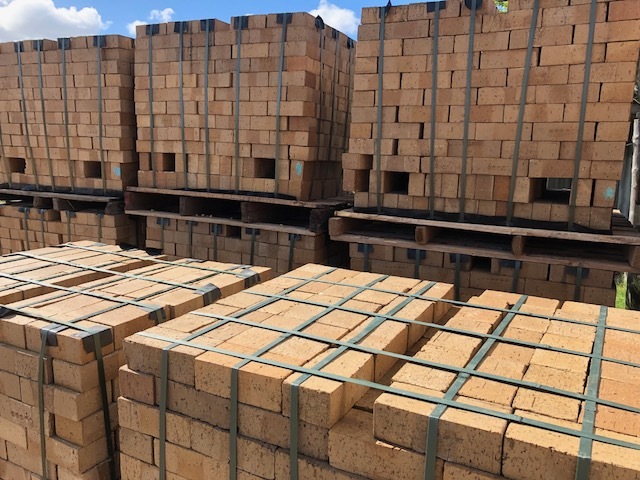 Extruded Brick: It is created by forcing clay and water into a steel die, with a very regular shape and size, then cutting the resulting column into shorter units with wires before firing. It is used in constructions with limited budgets. It has three or four holes constituting up to 25% volume of the brick. Molded Brick: It is shaped in molds by hand rather being in the machine. Molded bricks between 50-65mm are available instantly. Other size and shapes are available in 6-8 weeks after the order. Dry pressed Brick: It is the traditional types of bricks which are made by compressing clay into molds. It has a deep frog in one bedding surface and shallow frog in another. Burnt Clay Brick: It is obtained by pressing clay in molds and fried and dried in kilns. It is the most used bricks. It requires plastering when used in construction works. Fly ash clay Brick: It is manufactured when fly ash and clay are molded in 1000 degree Celsius. It contains a high volume of calcium oxide in fly ash. That is why usually described as self-cementing. It usually expands when coming into contact with moisture. It is less porous than clay bricks. It proved smooth surface so it doesn’t need plastering. Concrete Brick: It is made of concrete. It is the least used bricks. It has low compression strength and is of low quality. These bricks are used above and below the damp proof course. These bricks are used can be used for facades, fences and internal brickworks because of their sound reductions and heat resistance qualities. It is also called mortar brick. It can be of different colors if the pigment is added during manufacturing. It should not be used below ground. Sand-lime Brick: Sand, fly ash and lime are mixed and molded under pressure. During wet mixing, a chemical reaction takes place to bond the mixtures. Then they are placed in the molds. The color is greyish as it offers something of an aesthetic view. It offers a smoother finish and uniform appearance than the clay bricks. As a result, it also doesn’t require plastering. It is used as load bearing members as it is immensely strong. Firebrick: It is also known as refractory bricks. It is manufactured from special designed earth. After burning, it can withstand very high temperature without affecting its shape, size, and strength. It is used for the lining of chimney and furnaces where the usual temperature is expected to be very high. Facing Brick: The façade material of any building is known as facing brick. Facings bricks are standard in size, are stronger than other bricks and also have better durability. The color is red or brown shades to provide a more aesthetic look to the building. There are many types of facing bricks which use different techniques and technology. Facing bricks should be weather resistant as they are most generally used on the exterior wall of buildings. For the complete article, please follow the link above.